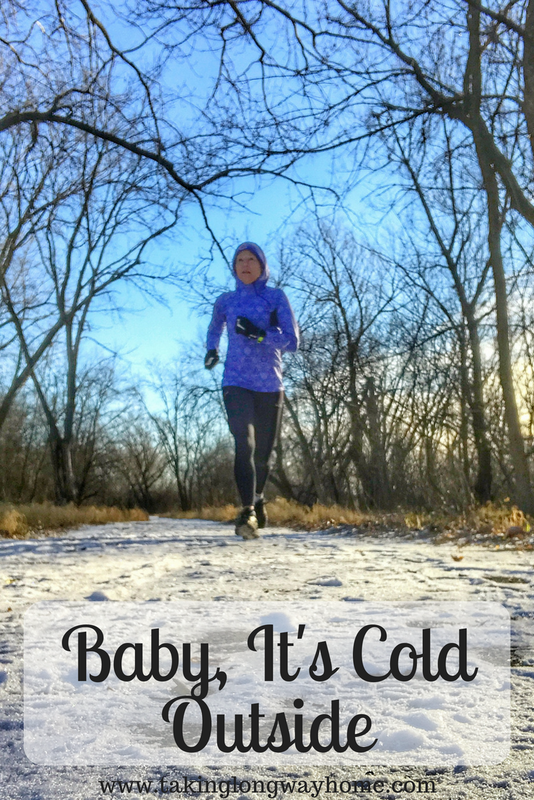 Taking the Long Way Home: Baby It's Cold Outside! Through my affiliation with Sweat Pink and Fit Approach, I received a pair of Tabio socks in exchange for my honest review. It was also very cold this week but I managed to get all my runs in! I was on a high most of the week after the Jingle Bell 5k that I ran last weekend. What a great way to wrap up the year. I'm on cruise control for the next couple of weeks. After the holidays, I'll ramp it back up again to prepare for the Mercedes Half Marathon in February!! 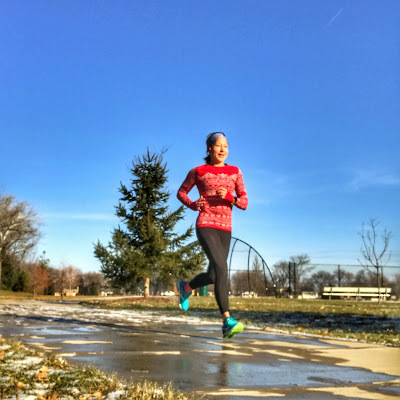 Most of my runs were done in below freezing conditions and even though we didn't have a lot of snow, there was enough to leave icy patches on my paths. I did 4:1 run/walk intervals all week, so slipping wasn't an issue. My biggest issue for most of the week was the wind. Thursday and Saturday's runs were under crystal blue skies and with the bright sunshine, the wind didn't bother me much. But on Tuesday and Sunday, the clouds just made it feel that much colder. What is it about the sun that makes us feel so zen? 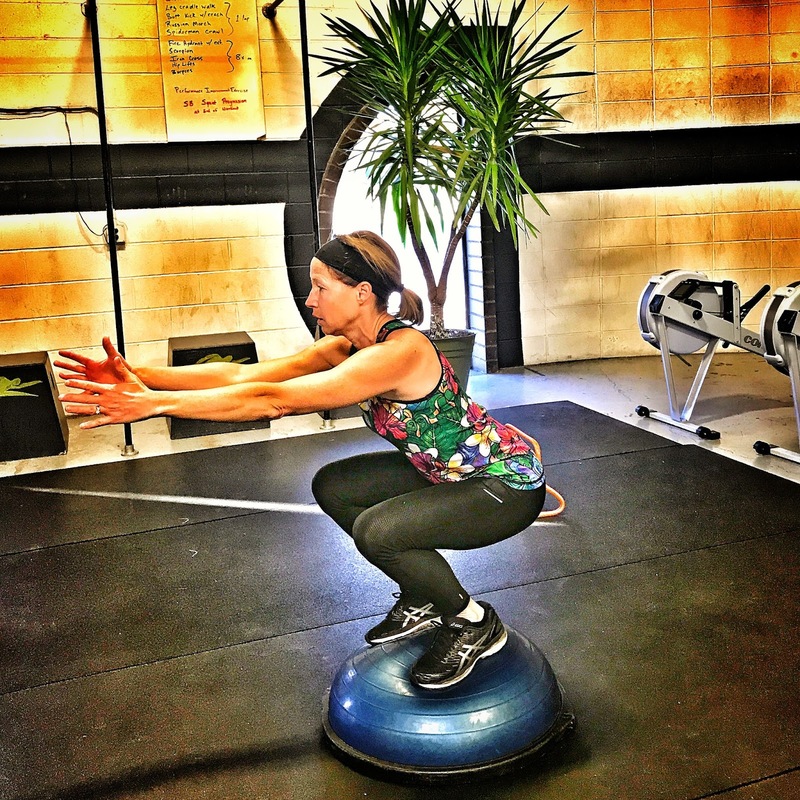 CrossFit without Steph feels so lonely....but my coaches kept me hopping. Literally. 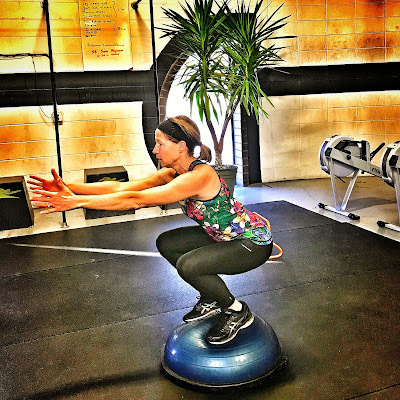 On Tuesday, Coach Kate's conditioning workout was set up like stations. 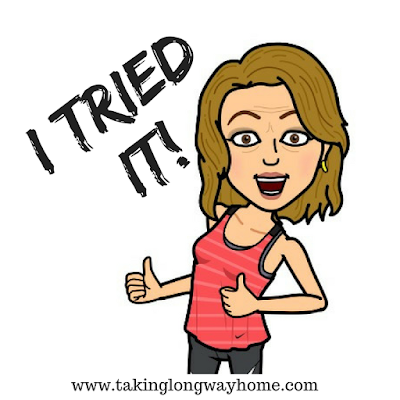 In between one minute rowing, I did one minute hopping over gates (they were low) and doing burpees, squats on the Bosu, plank walks, bird dogs, and something else that I can't remember. It was fun and it was hard! On Thursday, Coach Sammy Jo's strength workout had me doing back squats--I did 120# x 5 reps for my max set! This was alternating with shoulder presses. After that, I did hamstring curls on the fitness ball, some really crazy sit-ups (which I struggled with) and then around the worlds holding a 15# plate. Whew. Yoga was again at home on the mat, using one of the Five Parks Yoga videos (available on YouTube). Cocoa now has the idea that she can drop a ball on my head while I'm doing yoga, in an attempt to get me to play. I may have to go back to the studio. 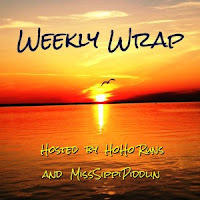 I've been getting a lot of requests for product reviews lately, so I've decided to feature one each week in my weekly wrap post! Feedback is welcome. Through my affiliation with Sweat Pink, I received a pair of Tabio running socks. 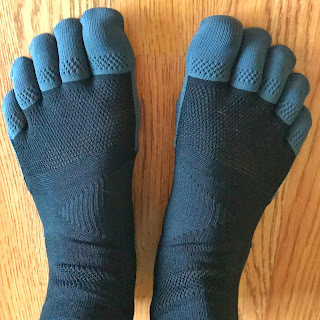 Regular readers know I have a minor sock obsession and as I love running in toe socks, I was anxious to try and compare these Japanese-made toe socks to the ones I normally run in. Tabio socks are the number one sock brand in Japan and they are planning on expanding to the US. I was sent a pair of the Signature Run Style, which retail for $25. The first thing I noticed when I opened the package was the rubber skid-proof tabs on the bottom of the socks. Since my cleaning lady thinks it's ok to spray Pledge on my wood floors, I appreciated the skid proof feature of the socks. 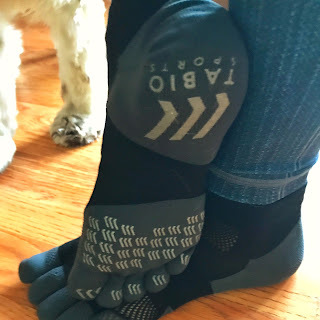 When I'm running, I don't have an issue with my feet sliding around in my shoes, but if you do, the skid proof bottoms will prevent that and any subsequent black toenails. There is mesh webbing over the toe area to keep the toes ventilated. When I first started to run in the Tabio toe socks, my toes were cold (it is winter) but as I warmed up, so did my feet. I wouldn't say that the mesh is a deal breaker and I'd love to see how this feature works in the summer. The socks are knitted with compression around the arch and anyone who has experienced plantar fasciitis will love that feature. I know I did. In fact, the arch compression was my favorite feature of the Tabio toe socks. Overall, I liked the socks. I didn't care so much for the gray color that I received, but on the website, there are a lot of fun colors to choose from. For me, $25 is a bit steep for a pair of socks but the socks have so many great features that it would be worth investing in a pair or 2. The socks are really well made and seem like they'd hold up to even the abuse of a trail ultramarathon. The socks fit like a glove and were easy to put on and take off. The compression was a definite win for me. If you like toe socks, I'd recommend taking the Tabio toe socks for a run! If you want to win a pair, follow Tabio USA on IG. They'll be picking random winners every day now through 12/25! If you can't wait to see if you've won a pair, use the code M1ER7RY through 12/19 to save 20%! How was your week? Is it cold where you are? Do you like running outside in the cold or are you a fair weather runner? Do you keep up with your workouts over the holidays? Tried any socks that you absolutely love? I like that these have skid-proof tabs on the bottoms. My feet do move around and even though I have enough room in my shoes I sometimes get black toenails. The cold, wind and snow is already getting to me this year. Those days that are sunny and calm feel too good! Nice job getting all your workouts in despite the weather and this busy time of year. I need those workouts to keep me grounded! I'm feeling really overwhelmed these days. Sometimes just sticking to a routine really helps. Those sit ups you are doing look intense-which of course means I have to try to figure out how to do them! I was wondering how those socks were. I do like the arch support as well. Was wondering how the toes would feel. I've never run in toe socks. Stay warm friend that wind can be fierce! I never thought I'd like toe socks until I tried them! Who knew? Those socks look pretty cool and functional. I love that they have compression and skid proof pads on the bottom. I loved the compression on the arch. Anything to keep PF away! There were days this week I felt like a weenie for wearing a jacket but was glad I did once I got a blast of the wind. Yikes! I found myself ducking in on trails just to shelter from it. Coach Lucifer tried to kill me on my bday with a wind bike-dead lift-front squat-weighted step up superset today. Loved it. You know me...I'm outside 99% of the time because 'Milly is not my gig. Your running is great, but your cross-training workouts area killer. I plan to focus more on strength-training come January (when my Streak is done). I've always done a little here and there, but I think it's time to up my game a bit. I truly believe that my cross training is what's keeping me in the game. I pretty much only run outdoors, but I don't have snow to contend with, so I'm luckier than you in that aspect. Still, I can always bundle up when it's cold, and that's way more appealing than having to run on the treadmill. Those socks are interesting but I think my toes are too short for toe socks - I tried Injinjis a while back and there was so much extra space in each toe that it looked comical on me! I never thought about not being able to fill the toes! Great job getting all of your workouts in this week....I'm super impressed with you getting out to run in that weather. I gave in this week and didn't get any workouts in until the weekend. I need to get that figured out ASAP so I can manage to fit in my clothes and transition to training in a month! Those socks look fun but I'm not sure how I feel about the grippies for running socks. We have to give ourselves grace over the holidays and do what we can. But after it's over, it's back to work! I am a fair weather runner (obviously). But I agree -- it's the damn wind! And the ice has made life really difficult, too. But it's been way below freezing much of the week -- single digits in the mornings, barely reaching 20s, and windy most of the days. I like toe socks, but I need padding for running & toe socks are just not usually cushioned enough for me. They do sound interesting, though. I've never thought about choosing socks for padding...I usually rely on my shoes for cushioning. What socks do you run in? 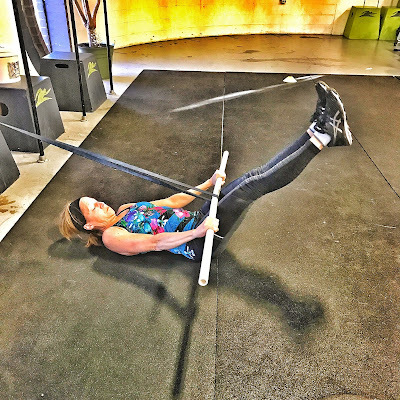 Your Crossfit workouts sound tough for sure - but that's why you are so strong! Those socks look interesting. I think $25-50 is the going rate for compression socks. I think you're right! Hopefully there will be coupons or specials to get people interested in these. To me, the right sock is just as important as the right show. So, for the right pair -- I'd probably pay that price. Nice CrossFit work this week...and always. Thanks for linking! There is something about the sun that makes everything better. It was cloudy both mornings this weekend, which made it difficult to get going. Good thing I didn't have to do anything, so I could take my time waking up. Yep. No sun yesterday made for a tired Wendy! It's been a struggle to get to my workouts while trying to get things ready for two kids coming to visit us in Hong Kong. We pick up the first kid today and I just signed up for BodyPump on Wednesday. Progress!! How exciting to have your kids visiting! Enjoy! Even on the coldest days the sun adds some extra warmth. After months of avoiding it, I love seeking it out now. I’m a bit like the Princess and the Pea with my socks. I feel everything, even a little thread, wrinkle, or pebble, and it drives me nuts. I’ve never been a fan of the toe type socks because of this. They’d be great for hanging around the house in cold weather though. That is if we ever get any. Never thought of running in toe socks! Those look cool! Happy Christmas week- stay warm! Right? 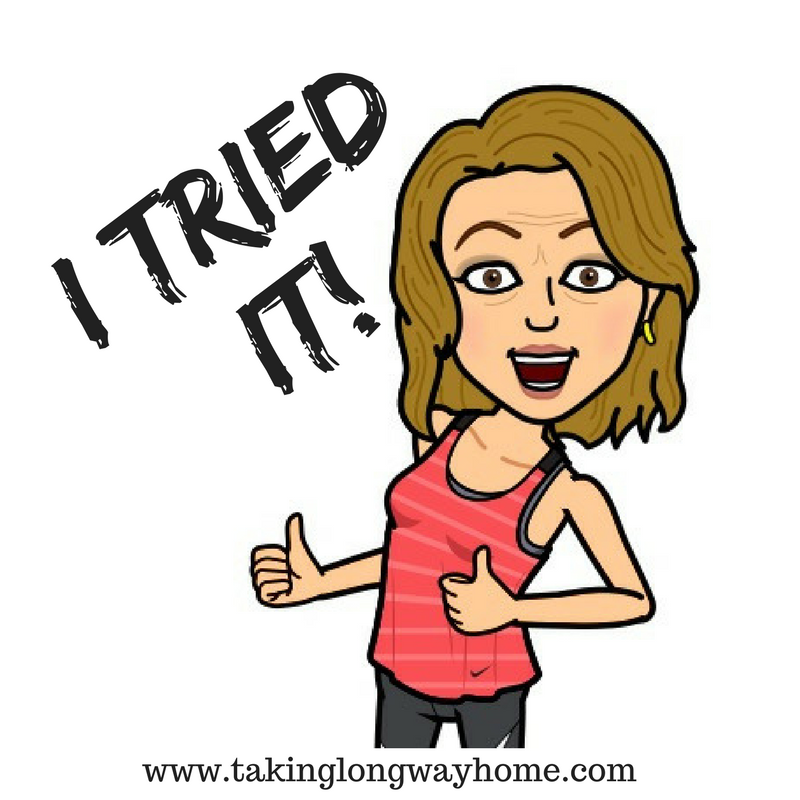 Try it, you might like it! The socks look cozy! I'm not sure I could wear socks that go on each toe! It's COLD running season now and there is no going back I suspect! However living on the east coast of Canada, you expect it this time of year! I like the separation of my toes. Who knew? I have run ONCE in the past two weeks. It's definitely not cold here - Santa Ana winds and fire have kept me inside (thankful for a bike trainer in the garage.) Hoping for a change this week. Of course "cold" here is anything under 50. Seriously, you should see me layered up when it's in the 30s! Great job getting all your runs in with the weather! It sounds like we have similar weather here. It was cold and just enough snow to be annoying. This week will be warmer, which is nice. It's been pretty warm since Saturday and I cannot complain. If this was winter, I'd be happy! Interesting. I have not worn toe socks since I was a kid and had no idea that they are really popular and so technical too. I would be afraid my toes would be cold but they might be okay for the shoulder seasons. I do think they are cute, and like the idea of the arch support. I really like the toe socks, but you are right, when it's cold, the toes need to hang together. In general I'd rather head outdoors for a run than face the mill, but I gotta say the wind around here has been brutal lately and I've been hiding indoors. The wind is always a deal breaker for me. That looks like a great strength session! I am curious how your toes felt in those socks. I was never a fan when they were popular years and years ago, but maybe these fit better! The first couple of times I wore the toe socks, they felt weird, but they really grew on me! Sounds like a great CrossFit workout. After I take a ton of time off from exercise, I'm hoping to get into CrossFit a bit. 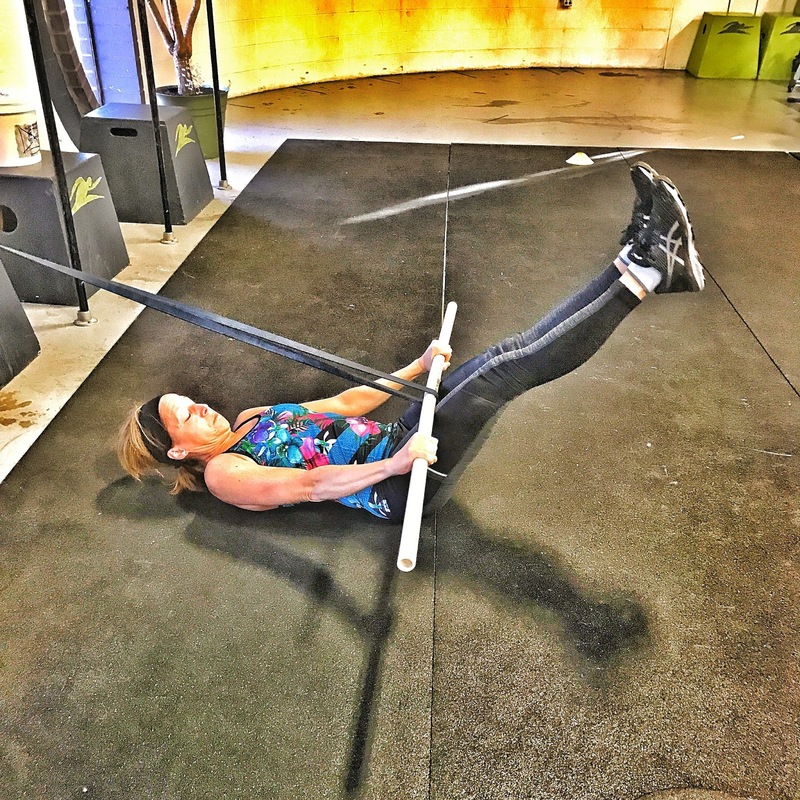 I'd recommend doing CF with a coach, so you don't exacerbate your injury! I have never worn toe socks (except the colorful striped knee-high ones we probably all wore in the 70s!) but they always seem so interesting to me. I worry especially with the rubber over the toes they would make the fronts of my shoes too tight. Are these also for running in just the socks but no shoes? Um, no. These are socks.Not shoes. Not those shoes. I actually really like toe socks! Those socks look so interesting!!! I've never tried toe socks before, but I may have to try those out! WAY TO GO on getting all of those awesome runs in!! I can't imagine running in below freezing temps! I thought 40 degrees was cold to run in here in Arkansas! You're awesome girl!! Oh, honey, we ain't seen nothing yet--at least when it comes to cold. I WISH 40 was as low as it goes here. Stay tuned! $25 is steep for socks, but they do look nice! I thought so but hopefully they'll have specials!